Is this especially popular in Iraq? Item 1. 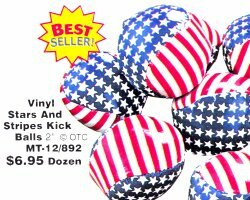 The Stars and Stripes Kick Ball. As a "Best Seller" is it a commentary on our current foreign policy? Is this especially popular outside the US? This illustration is taken from a catalogue of patriotic theme items, this is not an advertisement for the item nor is it an offer to sell the item. Perhaps we should send kick balls rather than CIA "interviewers".